In this week’s Sunday Sound Effects we are going to take a look at the Sound Collectors Club. I have been part of the Sound Collectors Club almost since its inception and I thought it would be great to share this great idea of collaboration and cooperative working a little wider so I asked the founder Michael Maroussas to share a little more about The Sound Collectors Club. PTE: When did you start The Sound Collectors Club? MM: The Sound Collectors’ Club was started in 2010 as a new way to share sounds online with likeminded sound folk all around the world. PTE: How can you join the SCC? 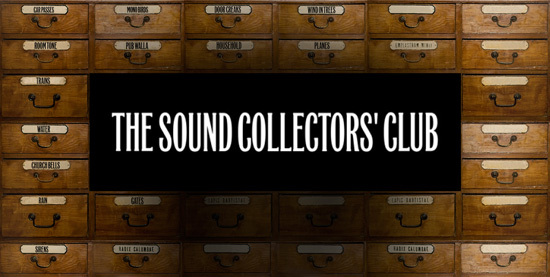 MM: We’ve just started a new Club membership year for 2015, so if you’d like to join us then please visit The Sound Collectors’ Club and click on the blue button on the right hand side of the homepage. PTE: How much does it cost? MM: For just £20 per year, you can start contributing to and sharing the Club’s sound collections, plus reach out to other sound pros around the world via your automatic invite to join the Club’s shared Evernote notebook, ‘The Knowledge’, as well as the Club’s new LinkedIn discussion group. There, that’s the 20 second pitch done! PTE: The SCC has gone through a number of different models since you started it back in 2010. How does it work now? MM: The Club is based upon the folder sharing capabilities of Google Drive. When you join, you are allocated your own specific ‘uploading’ folder, which is what you use to share your sounds with the Club. The idea is that members can then upload their recording, which relate to one of the given Club themes announced on the website, and subsequently gain access to another shared folder of everyone else’s recordings that have been accumulated since that theme began. The more themes you contribute to, the more you gain access to. We’re basically crowdsourcing sound fx collections online. PTE: So if you contribute a sound to a theme, then you get access to all the sounds that everyone else has contributed to that theme? MM: Yes that’s right, by contributing just one recording you could end up with a small arsenal of sounds to add to your library. Once your uploaded recording(s) has been approved by me and transferred into the appropriate theme folder, you get emailed an ‘invite’ which will give you direct access to all the tracks which that theme contains. You can then download this theme folder and sync it to your desktop so you’ll automatically receive sounds contributed to that theme in the future. You are then free to use these sounds within commercial projects without any restriction other than you obviously mustn’t go and sell them on as sound effects - individually or as libraries. PTE: Are there any other benefits of being part of the SCC? MM: Although The Sound Collectors’ Club was primarily set up with the simple ambition of collecting sounds, it has also turned out to be a really useful networking tool over the years too. The vast majority of Club members are film or TV sound professionals - sound designers and editors, recordists or mixers - so the Club offers a great platform for these members to reach out to their peers in other countries. Inevitably, collecting together encourages interaction; and that interaction can and has grown into anything ranging from sharing ideas and techniques to commissioning field recordings or even working together remotely. The Club is a good foundation for this as members’ involvement in sharing sounds with each other over the years helps to build the trust and respect needed in order to embark upon these new collaborations together. In short, this is a professional club, not just a hobbyist one! So please consider joining now for 2015; the very nature of this kind of crowd sourcing means the more the merrier! Wishing everyone a great 2015 and thanks again, Mike, for your support. PTE: Michael, thank you for taking the time and trouble to set up The Sound Collectors Club so that we can share our sounds and get access to lots of other great sounds too, and it is brilliant to see that the SCC as also grown into a vibrant cooperative community and we love to spread the news of other self help communities like our own.